Creature. That is what my daughter calls her weebeast. The moment the weebeast arrived at our home, she claimed it her own special "Creature." The charm of the weebeast lies in its uniqueness. Nothing else in our home looks anything like it, allowing our imaginations to freely soar. Because we only allow civilized creatures here we took on the task to clothe the poor, naked thing and quickly found a suitable purple dress from the doll stash. Now the bare-bottomed but clothed weebeast fits comfortably in its new habitat. (See right.) 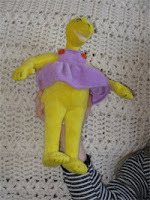 My daughter loves the strange, yellow weebeast. Apparently Dr. Toy does too, naming it to the Dr Toy's "100 Best Children's Products for 2008" list. 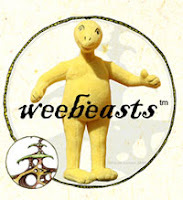 Micah Linton, a highly imaginative artist, created and has recently chronicled the weebeast species in his weebeast series of books. We received the plush weebeast in a burlap sack along with the books Weebeastology Volume I and weebeasts: plight . What are weebeasts? Linton describes them best: "Weebeasts have existed since the dawn of time when they lived on Pangaea. As the land mass separated they became isolated and ended up in remote regions of the earth where they were called many things by humans according to local beliefs, mythology and folklore. 'Trolls, pixies, elves, gnomes, gremlins, and goblins' are just to name a few, but in all truth almost every culture has a name for them." A noble adventurer, Linton has taken it upon himself to research and record all things weebeast. His "findings" are published in his weebeasts books, with more books in the series releasing in the future. Aimed toward tween readers ages 9-12, this box set of three books expands upon the illustrations featured in the picture book series. The wordless books require the reader to create their own storyline about the weebeasts, using the illustrations as a guide. I very much like that Linton left out the words. The exclusion makes the volumes unique and encourages creativity. My favorite illustrations are of weebeasts enjoying life at a weebeast fair and parade. The detailed pen and watercolor artwork in the books clearly illustrates the weebeast civilization and history. The book covers have the look of a leather journal. Children learn the value of living in harmony with others through the weebeasts stories. Just one note: The books show the weebeasts as a primitive though quite intelligent species, so they are naked and bare-bottoms are visable. The books will especially appeal to children interested in ancient civilizations and archaeology and science fiction / fantasy genres. I really like the wordless volumes. The creative series gives kids the chance to become a weebeastologist expert like Linton and as a result they may create their own weebeast adventures. One last thing, I've done a little digging myself and have discovered a possible distant relative of the weebeasts - Seuss's Sneetches. What do you think, Mr. Linton?